Tragically, tens of thousands of Christian men are members of the Masonic Lodge. A surprising number are pastors, deacons and elders! Sadly, these men have their spiritual eyes blinded to Masonry’s bloody roots, perverse hierarchy and despicable, secret rites. Exposing ALL THIS MASONIC EVIL in a passionate argument often creates volatile anger and deep resentment – which feeds demonic entities and thwarts their liberation in Messiah! HOWEVER, with sincere prayer and the seasoned, Scriptural instruction provided in this DVD Teaching, you can speak CONFIDENTLY to those deceived by Masonry’s DARK COVENANTS and start ministering Yahushua’s Liberation and Deliverance with authority! Dr. Schnoebelen is a former Master Mason, Freemason, Lodge Junior Warden and 32nddegree Scottish Rite member. He has ministered for Christ Messiah since 1986, bringing thousands to Salvation for the glory of Yahuwah - while counseling pastors, teachers and other ministries in Spiritual Warfare and victory for these End Times. A prophetic teacher, prayer warrior, Scriptural scholar and defender of the faith - he shares highly effective apologetics and experience here - so YOU can pose gentle, non-threatening but deeply probing questions concerning fundamental Lodge activities with men who profess Christ yet owe allegiance to the Worshipful Master of their Lodge! LEARN: To compare Scripture against arcane, Masonic obligations and rites, and share Dr. William’s testimony of liberation from his nine years of intense involvement with the Lodge. 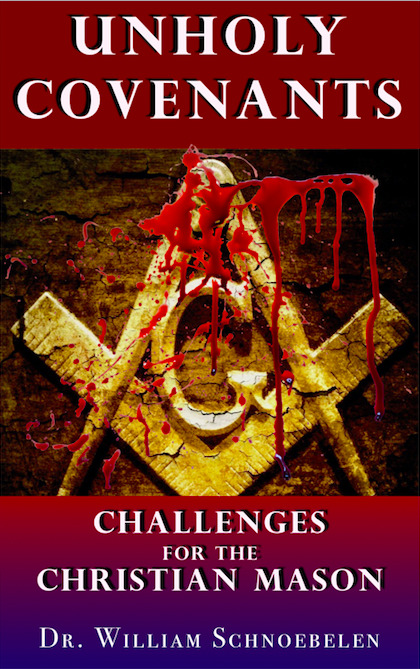 Witness to others the anti-Christ dangers of Freemasonry – all without the shock factor! SPECIAL FEATURE: Dr. Bill leads in anointed liberation prayer, teaching you how to renounce Lodge membership, spirituality, headship, and how to compose a “demit letter” to various Masonic bodies to sever demonic chains from the dark forces behind Masonry!